Passive and active range of motion between 30 - 70 degrees for 4 weeks. Brace will set to this range of motion. *Avoid any extension beyond 30 degrees for 2 weeks post-op. OK to stretch into flexion per patient comfort 2x/day immediately post-op. At 2 weeks post-op, come out of the brace twice a day for extension (straightening) and flexion (bending) range of motion stretching to full range as tolerated. Hold each stretch for 1 minute. Do 2 sets of 1 minute each time (therefore 4 sets of extension per day and 4 sets of flexion per day). Remove brace for stretching. Crutches to assist weight bearing progressing to full as tolerated with brace. Patient to wear knee brace while sleeping for 4 weeks post-op. Exercises should focus on early muscular recruitment. Begin physical therapy as soon as able for soft tissue mobilization, anti-inflammatory modalities, and general conditioning. Patients are given a functional assessment/sport test at 3 months, 6 months, 1 year. Icing and elevation as per icing protocol (please see handout for full details). Soft tissue treatments, gentle mobilization to posterior musculature and patella. No portal mobilizations at this time. Leg raises (30 degrees of knee bend with brace on) (lying, seated, and standing), quadriceps/adduction/gluteal sets, passive and active range of motion exercises within guidelines, well-leg stationary cycling. Gait training to normalize walking pattern. Weight bearing as tolerated with brace. Passive range of motion 30-70 degrees x 4 weeks. Nurse visit at Day 14 for stitch removal. Continue with effleurage, soft tissue treatments, patellar glides, and passive range of motion. Incorporate progressive and gentle functional exercises (squats/knee bends, modified lunges, step-ups). Continue with pain control, range of motion, gait training, balance/proprioception and soft tissue treatments. Begin pool workouts after the incisions are healed and with the use of the brace. Begin two-legged aerobic exercises as range of motion allows (VersaClimber, stair machine, upper body ergometer, NordicTrac). Range of motion 30-70 degrees x 4 weeks. May wean off brace with full range of motion if significant weakness or apprehension is present. Push for full range of motion with emphasis on extension. Continue soft tissue mobilization, joint mobilizations as needed. Initiate scar mobilization once incisions closed. Increase intensity of all exercises with focus on closed-chain, functional progression. -Stationary and road cycling as tolerated. Range of motion 0-110 degrees. Gait no brace, good mechanics. Initiate scar mobilization at 4 weeks. Continue soft tissue mobilization, joint mobilizations, and scar mobilizations as needed to gain full range of motion. Continue to increase the intensity of exercises (i.e. stretch cord resistance, adding weight, increasing resistance of aerobic machines). Begin to incorporate sport or activity specific training. Range of motion 0-130 degrees. Progression of program of increasing intensity to sport specific tasks and activities of daily living. Continue to challenge balance; progress to increased dynamic tasks, BOSU ball, wobble board. Able to descend stairs, double leg squat hold for >1 minute. Bike >30 minutes with moderate resistance, Elliptical with interval training, Flutter-style for swimming (no flippers, no breast-stroke kick). Incorporate bilateral jumping exercises once able to demonstrate adequate strength- start on trampoline or Pilates jump board. Watch for compensatory patterns with take-offs or landings. Complete Sports test 1 at 3 months. 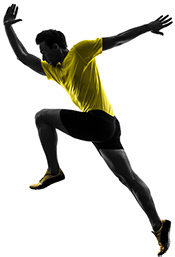 Continue to increase strength, endurance, balance, and sport specific training drills. Patients are not scheduled for another M.D. appointment until 3 - 4 months post-op. At this time, range of motion should be at or near 100 % and any restrictions or concerns should be communicated to our office. Swimming (no fins until > 12 weeks), outdoor cycling. Slow Return to sports > 6 months if approved by MD and completion of Sports Test.